Are there plans to banish Queen Elizabeth II from new coins? Does Britain's small change herald change? Put simply, is the United Kingdom headed towards a republic? Monetarists may think so... News of the first major design change in English coinage since decimalisation is barely moments away, and TheBigRetort has stumbled across some breaking news. The Queen's head may be banished from the front of the new coins. The Royal Mint design has in the past carried the monarch's visage but is it possible that the seven newly-minted coins may change... radically? There have been hints that 'a contemporary take on traditional heraldry reflecting the nation's rich history' may be found on the reverse of the coins, but what about the face? In a radio interview given today, the Royal Mint let slip that the 86 million coins in circulation with the Queen's face, 'will be around for some time yet' - on old coins. Up to now it was believed that the Queen's face would be kept on the front of all seven newly-minted coins, so what does the future hold the monarchy? When it comes to offering 'best deal' holiday packages to Paris does Eurostar make the grade, or does it have tunnel vision? TheBigRetort discovers... la vérité. So, was it the best deal? The reservation for our additional guest needed to be changed to one night instead of two. However, the amount returned to the credit card for the cancellation was not the same as the amount paid for the additional night. Who had pocketed the difference? Eurostar informed us that the difference was a 'penalty' levied by the hotels for the, err, 'amendment'. Which seemed strange... Intrepid travellers to France, where we are known as Zee Big Red Tart, we had never encountered such a penalty. Neither had we experienced an 'additional' charge for a child residing in the same room. A charge of £23.52 (plus taxes) a night, which again we were informed was levied by the hotels. In fact the French don't pay or charge such a levy. "No such penalty is charged," they informed us. Adding, "There is no extra guest charge for a 6-year old either," which was intriguing. A case of less is more with Eurostar offers surely... So what did Eurostar have to say? Did it come clean and return our Euros? Or did Euro simply keep them? When presented with our findings Eurostar's press office (e-v-e-n-t-u-a-l-l-y) wrote back: "Due to the complexity of your email I am just checking the final details with various people across the business. I hope to have a comprehensive answer for you within a day or so. Sincere apologies for the delay." Following which... more online delay followed. But what 'complexity'? What 'fine detail'? And when would we receive that 'comprehensive answer'? To recap...tickets booked via the telephone through Eurostar were more expensive than those offered online, the hotel did not levy charge for reducing a room from two nights to one, and French hotels do not usually charge for a child staying in the same room as adults. 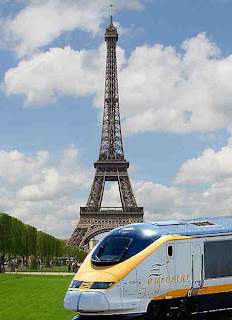 Eurostar does, blaims the French... and pockets the difference. At least that's what we decided to put to Eurostar.... but not without incident. The question was really a simple one. Based on what Eurostar claimed, later contradicted by the hotel, either we had highlighted it selling porkies or caught it going down the wrong track. Something TheBigRetort would have thought that the operator would have been keen to address. Parker claimed that accommodation, which was booked through eurostar.com, is actually provided by WWTE, a subsidiary of Expedia. It has 'a separate arrangement with the hotel concerned,' he wrote. And as a result Eurostar 'could not comment'. Neither could it comment on the additional child levy that the hotel also claimed it did not add. And neither did it add up for Eurostar. "We will however follow this matter up with WWTE and ensure that there were no improper charges made in error in this instance," Parker assured. Unfortunately as we did not hear further, we assume that Eurostar also felt that there were 'no improper charges made in error' - just, dare we say it, a slight of hand worthy of a card shark camped outside Kings Cross Station. To be fair, Parker claimed that when he checked the online price of a return ticket on the same trains he found 'exactly' the same price. Although his search was conducted after our own, he could not explain the difference 'at this stage'. He never got back to us. TheBigRetort can only conclude that he could not explain the difference at any stage. So, thinking of travelling with Eurostar on a 'best deal'? Arrête! Think twice.